Originally scheduled to ship soon after the iPad launch in April, both the keyboard dock and 10W USB power adapter for Apple's tablet computer now have estimated ship dates sometime in the month of May. In addition, the $39 iPad soft case, which was originally scheduled to ship on April 3 when preorders began last Friday, has been delayed until mid-April. 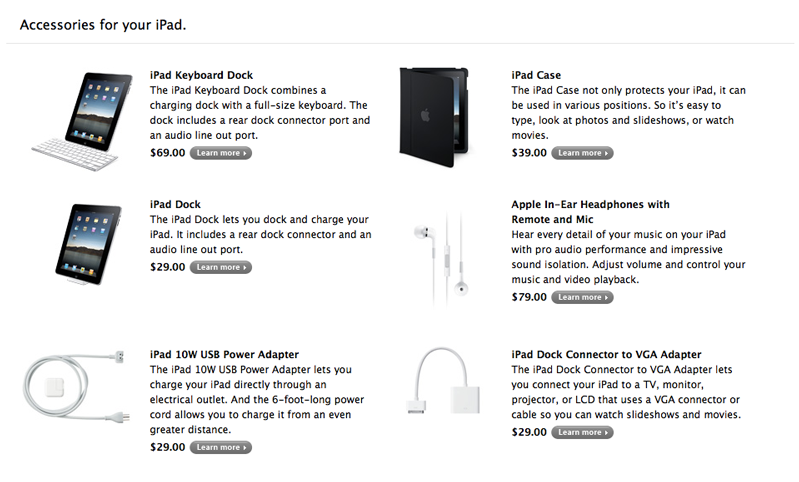 The $69 keyboard dock was originally scheduled to ship in mid-April, and the $29 USB power adapter in late April. Estimated shipping dates for the iPad dock ($29) and dock connector to VGA adapter ($29) remain unchanged and on schedule for the April 3 launch. In addition, the Apple in-ear headphones with remote and microphone still ship within 24 hours for $79. Last Friday, Apple began accepting preorders for the iPad, set to launch on April 3. However, the company limited purchases two two per customer, for both regular consumers and businesses. Apple sales representatives confirmed last week that initial orders for both businesses and consumers are limited to two per person. In addition, AppleInsider received word that the number of iPads shipped to each retail store location will be based solely on the number reserved for pickup at that store. In other words, fewer in-store reservations will mean a lighter stock of hardware. While the Wi-Fi-only iPad is set to launch in the U.S. on April 3, the 3G-capable model, which carries a $130 premium, will go on sale later that month. In addition, international orders for both the Wi-Fi and 3G models will be filled in late April.